Onlinestrength reviewed the 81 best-selling ashwagandha supplement brands in the United States. See our list of the highest quality brands below. The average American suffers from Chronic Fatigue Syndrome, low energy, poor libido, weak immune systems and poor health. Living with poor health can have devastating consequences, too, including having below average stamina; low energy; fatigue; muscle tension; fat gain; irritability; insomnia; poor sexual performance; social anxiety or nervousness; and depression. But don’t despair. Research shows that adapotenic herbs like ashwagandha can help fortify your body, giving it the strength it needs to keep you healthy and happy. Studies suggest that ashwagandha can reduce social anxiety, improve physical performance (strength and endurance) and cognitive performance (focus and memory). Fortifies your immune system preventing you from catching the common cold, flu, or unwanted illnesses. Significant improvements in overall sexual function, including arousal and satisfaction. Promotes healthy sleep and can help individuals who are suffering from insomnia. Shown to improve cognitive function and reaction time. Helps fight signs and effects of aging. Improves physical performance and cardiovascular endurance, boosts velocity during sprints, increases leg muscle strength and aerobic capacity. Ashwagandha is an Adaptogen herb grown in India and in a certain select area of Nepal. The roots of Ashwagandha contain withanolides, which are special compounds responsible for most of this herb’s effects and benefits. Supplemented primarily for its ability to reduce anxiety, fight depression, treat insomnia, improve poor physical performance, poor libido, and low stamina. Ashwagandha is said to help rejuvenate and regulate hormones, improve thyroid function, increase stamina, lower cholesterol, boost immunity, and heal adrenal fatigue. Ashwagandha supplementation can help stave off social anxiety and stress. Furthermore, may help combat anxiety induced by stimulants such as caffeine and stress caused by physical exercise. Unlike anti-depressant and anti-anxiety medications, ashwagandha doesn’t cause any adverse reactions. Studies suggest that ashwagandha can help those who suffer from insomnia or who have trouble sleeping. Ashwagandha has been shown to boost cognitive function and memory. This is largely due to the powerful antioxidant effects that destroy free radicals which can cause cognitive decline. Due to its calming and energizing effects ashwagandha has been shown to boost stamina, improve physical weakness, increase concentration, boost motivation, and increase energy. If the supplement is using an ashwagnadha extract, the label should state the amount of “withanolides” inside each serving. This is a compound known to contribute to ashwagandha’s overall effectiveness. ). For the highest quality be sure the ashwagandha herb used to make the supplement is sourced from an organic farm. You will find 1 of 2 variations root extract and/or root powder. Extracts are more potent and have overall higher effectiveness. 500 mg (.5g) – 1,500 (1.5g) Ashwagandha root extract. Extract products should contain at least 1.5% total withanolides. A minimum of 6 mg of withanolides per serving. 10 mg – 30 mg withanoldies is what most research studies use. 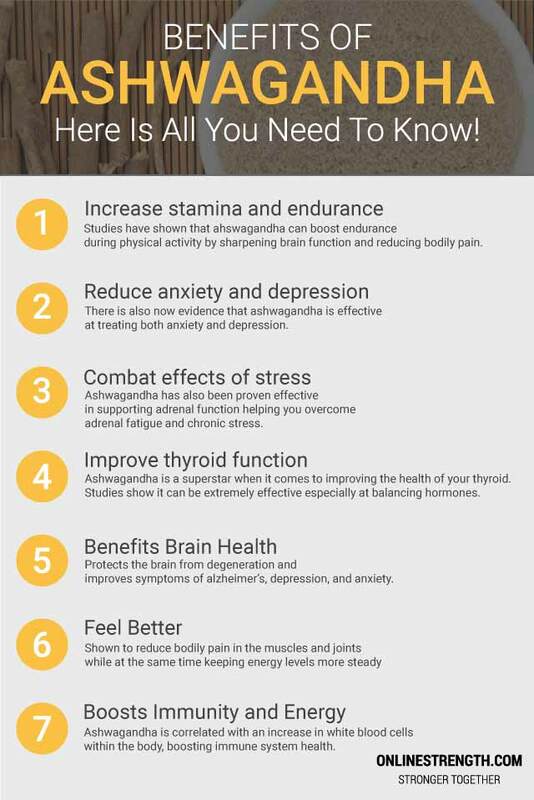 Ashwagandha is known for its powerful positive effects on the central nervous system and has been shown to be particularly beneficial at boosting immunity, increasing energy, improving cognitive function, reducing stress, eliminating anxiety, and more. Onlinestrength.com analyzed the 10 best-selling ashwagandha supplement brands in the United States for Withania somnifera, Withanolides, and the presence of preservatives, fillers, and potential contaminants. If you are looking to feel better, have more energy, look younger, concentrate more, and increase your physical and mental vigor then ashwagandha may be the single most beneficial herb you should be supplementing right now. Ashwagandha is known as the “strength of the stallion”. Some experts believe the name suggests that one who ingests ashwagandha can attain the strength and vitality of a horse. This botanical herb is associated with re-invigoration, strength, energy, and its extraordinary anti-anxiety (confidence boosting) properties. If you’d like to speed up your research into buying the absolute best ashwagandha supplement, know that the product you are buying is organic, non-gmo, and filler free, and be confident that you are not over paying, then this might be the most important article on ashwagandha you’ll ever read. What you are about to read below is the most comprehensive objective information regarding ashwagandha on the internet. We reveal how to find the best ashwagandha supplement; full of “reviews” and “tips” that you may not find anywhere else. We spent 170 hours researching the ashwagandha industry, individually researching every single product on the market. During that time we built a list of 67 different ashwagandha supplement brands, consulted with holistic health experts, spoke to countless manufacturers, and investigated the farming procedures used to cultivate the ashwagandha plant. Armed with countless hours of research we are more than capable of helping you become more knowledgeable than the average ashwagandha consumer and holistic health expert. Ashwagandha supplement manufacturers are definitely not going to share this information with you because they need you to buy their product to stay in business whether its the best choice for you or not. In the end, we determined that pure, organic, non-gmo ashwagandha herb (farmed on organic soil, free of additives and pesticides) was the key to a great ashwagandha supplement. Aside from finding a product that uses organically grown ashwagandha herb, below are a few guidelines we recommend you follow when searching for an ashwagandha supplement of your own. Do not be fooled by the low prices you find online – they don’t mean anything unless the product contains contains only 100% organic ashwagandha root. Statistically only individuals who are properly informed about ashwagandha purchase products containing non-organically farmed herb. Just because the product is cheaper doesn’t mean you’re getting a better deal. Usually the supplement won’t be as effective as its organic counter part. Tip #2: Ignore the gelatin. You can go crazy reading what everyone has to say about buying plant based herbal supplements that use animal based capsules. Simply put there is no simple answer on whether you should avoid gelatin based capsules. For purchasing ashwagandha in capsule forms its best to avoid gelatin capsules and find plant based ones. Usually plant based capsules are more expensive and contain higher quality herb. PS: When taking plant based supplements (basil, turmeric, mushrooms, ashwagandha) its always best to have the capsule plant based as well. Ashwagandha supplements should not contain any “other” ingredients. There is no reason for the capsules or powder to contain any other additives. You don’t want to buy an ashwagandha product with additional ingredients in its formula. Although this herb was initially used in ayurvedic medicine for its beneficial properties thousands of years ago, only recently has ashwagandha become known as one of the most impressive herbal supplements in the holistic health market. In fact, in ancient times ashwagandha was called “strength of the stallion”, acknowledging that perhaps no other single herb could have the potential to give users the strength of a horse. Clearly, ashwagandha benefits are highly touted and deservedly so. To date, over 307 studies, articles and unique scientific reports have focused on ashwagandha benefits and this herb’s ability to treat an array of different health conditions. Overall ashwagandha appears to be a safe herb for medicinal use, and has been used for hundreds of years without any major incident. The beneficial properties of ashwagandha make it viable in improving strength, stamina, vitality, and mental vigor. Withania somnifera’s powerful adaptogen properties have helped many individuals recovery from a depletion of resilience, social anxiety, depression, fatigue, chronic stress ailments, and acute physical weakness.